Group Members : Gareth Ayres (me), David Laker, David Williams, Wongun Choi, Jon Davies and Husien. For those of you who haven't heard about Badger Wars, i bet you are thinking WTF?!?! Well this is part of what makes Badger Wars so successful. Simple put, Badger Wars is a web browser based online game, with more than 700 users and 1000 Badgers. But as with most things, there is alot more to it than that. We had a year to do the project, and it was worth 3 modules, so we thought, wow, better put alot of effort into this. I was assigned group leader, and the project began. We spent alot of time modeling the system in UML, and arguing if a gimp costume would be better Armour than a american football helmet, and then we got into the programming. Me and Laker were the programmers, and we decided to use PHP for the system. We spent a fair amount of time programming what we had designed and modeled, and as with all software projects, came to a few problems along the way, but in the end, we got it all working. We released the first beta version onto the net for testing, and got a brilliant response from the testers. We got some artwork from users, and loads of feedback, and eventually got Version 1 public just in time for the project assessment and presentation. Needless to say we got a first for the project, as it was significantly more indepth a project than was required. The presentation seemed to cause the lecturers to be awe struck, but they were mainly a bunch of electrical engineers, and not too familiar with the technologies we used. Badger Wars is currently in version 2 beta testing, and has 12k hits and about 100 users logging in each day. This project has shown me exactly what potential the internet has, and how amazing it can be when exploited correctly. There are still lots of problems with Badger Wars that are holding it back from even bigger things, but these flaws are fundamental to the system, and were impossible to predict. I hope that they are changed, but i am currently not working on Badger Wars, and i am just keeping it as one of the most important learning experiences of my life so far. The amount of support a community will provide just because they have a interest in your work is amzing, and not to be underestimated. This is certainly a area of development i will be working on again in the future. A mixture of the fun of games, and the brilliance of the internet is something that can lead to very exciting things, as has been seen. 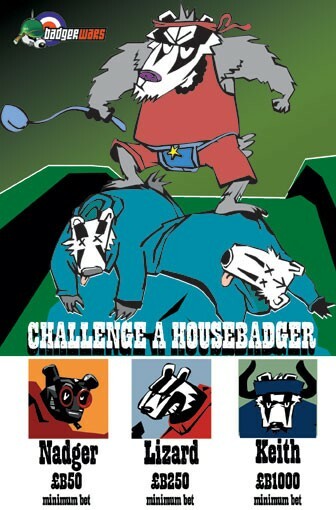 Badger Wars is a Online, Browser Based Game. It involves creating a account as a Badger Trainer, and training up a few Badgers to be the best killing machines you can. It has a great comical side to it, and is one of the main features of the site. The weapons range from a spoon to a genetically enhanced badger limb. The latest version of Badger Wars is starting to introduce a Badger World, with everything you would want in it. The fundamental part of the system is obviously the fighting. You can either enter a big War, with up to 15 other badgers, or challenge a Badger to a one vs one fight. 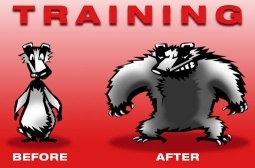 Badger Wars contains its own mail system, ranking system and training system. Its all in all a lot of fun! The Best way to see what Badger Wars really is, is to try it for yourself! I would recommend you do, as its free and great fun! Where is Badger Wars Going?